Dear person who has never seen a leatherback turtle nest. You are not alone. Most people haven’t seen this awesome sight. It’s not surprising, leatherback turtles may travel the world as they seek feeding and mating regions, but they are not visible all over the world. I want to tell you that I’m happy you’re reading this. There are so many things to tell you. I could tell you about the magnificence of the leatherback turtle. I could tell you that it’s said that only 1 out of every 1000 eggs make it adulthood. I could tell you that the sight of the leatherback turtle mother arriving on the shoreline is something that you’ll never forget. I could tell you that what you’ll feel like is like the same way you felt when you first saw dolphins. That same feeling you had when a first child arrived. The awe and wonder of nature. Witnessing something that makes you feel so touched, so emotional, so much like you’ve melted inside. 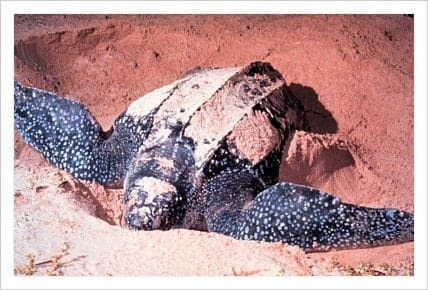 Or I could just tell you to go and watch the leatherback turtles as you never know how much longer they will be here. There is so much plastic in our oceans. Those poor leatherback turtles easily get confused between a plastic bag and a jellyfish. They are gradually making themselves ill on the rubbish and discarded manmade items that us greedy, selfish and lazy humans leave all over the planet. Refuse caused directly by our laziness and materialism. The plastic bags that we use to carry everything from snacks to cleaning products to pasta to bottled drinks, all wrapped conveniently in plastic for us to carry home and use. The same plastic that is now making it difficult for our sea life to survive. The same plastic that could even change our own DNA forever or will eventually at least make us ill as we consume it from our own food chain. Here at Petite Anse we usually write about fluffy nice things. Walks through the countryside, what we love about passionfruit, how to take nice pictures of Caribbean flowers. But today the mood is different. 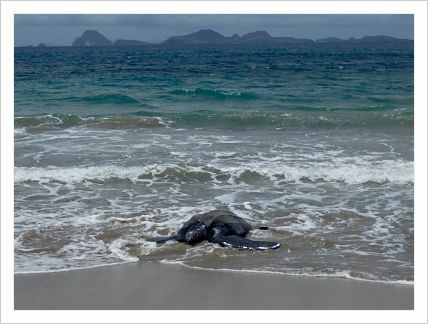 Seeing a leatherback turtle is unforgettable. It could also help the turtles to live longer. The small fee charged is for you to be accompanied by a guide along Levera Beach. You’ll learn about how the leatherback travels up to 10,000 miles to return to the same beach they were born on. The fee will be used to keep the program going. This makes it more available to others and spreads the word about how magnificent these creatures are, how they need to be protected and not to throw plastic bags into the sea because they confuse them and cause illness and fatalities. 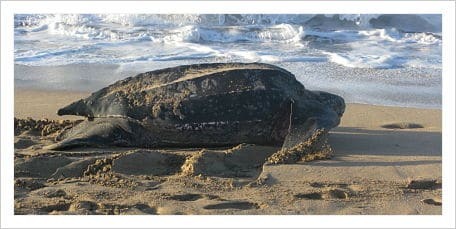 Dear person who has never seen a leatherback turtle nest, take it upon yourself to do so. You won’t regret it and you’ll remember it for the rest of your life. Discover our leatherback turtle watching activity.